For the last 9 years, I've been playing an online RPG. I've racked up way more game play hours than I should probably admit. I've had to restart my character 3 times from scratch. I've quested, I've battled, I've run my character for hours and hours all over the maps, I've explored and I've adventured. I've made friends online and been proud to watch them over the years as they've gone through life experiences like graduations, marriages, births of children – and all around growing up. I've felt like an online den mother to many of them. I've tried to quit – and managed to for almost a year before starting again. But I keep on playing. Why? The main reason is that it's something special for my husband and I to do together. It gives us a common hobby, something outside of the kids and house and life to talk about. We can set goals together and enjoy an activity together. Although I consider myself more than the average gamer, my hubby is more so. When he heard that Final Fantasy XI was coming out in North America, it was on his high-interest radar. I surprised him with it for his birthday in 2004. I only bought 1 copy of the game – because I didn't plan to play on it. But after watching him play for hours every evening, and home alone with a newborn through the day – I ended up making my own character on his account. It gave us something to talk about. Before I knew it, I had my own account and we were playing together. It's completely changed our marriage. By involving myself in this online world, we've been able to have a common ground, something to work on together and enjoy. It's been something we as a family can talk about (as our children have grown up watching us play and love the online world as much as we do). I love how my boys will press around Daddy to ask questions and feel like they are exploring alongside with us. I don't play every game that my husband plays – he's much more into strategy games like RISK and such that I could never join in and enjoy. (I find them frustrating instead of fun!) But I can pay attention and listen when he talks about them, try to understand what he's doing, and appreciate the skills it takes to succeed at them. Do you play games with your spouse? Do you find it draws you together? Lisa Marie Fletcher is a Canadian, homeschooling mom of 4 boys, and wife to a man in the golf industry. She keeps herself (extra) busy by blogging at Learning Titus 2, reading, and doing other miscellaneous design work. She loves to game - and spends many an evening playing Final Fantasy XI online with her hubby. That's a really sweet story!! I do play games with my partner -- from simple puzzle games that we try to solve together, to RPGs, to action games that we play against each other. I don't play as much as I used to, as he is not a huge gamer either. I tried WoW once because hubs was playing, but I just didn't have the time. Turns out, neither did he and he cancelled. Now he plays on his portable during his morning commute and we swap games back and forth between the two of us. Still fun and I feel like I have more time with him. My husband and I played WoW - it was great while it lasted but the two year old takes all our "spare" time now! My boyfriend and I play together. He mans the controls and I solve all the puzzles! 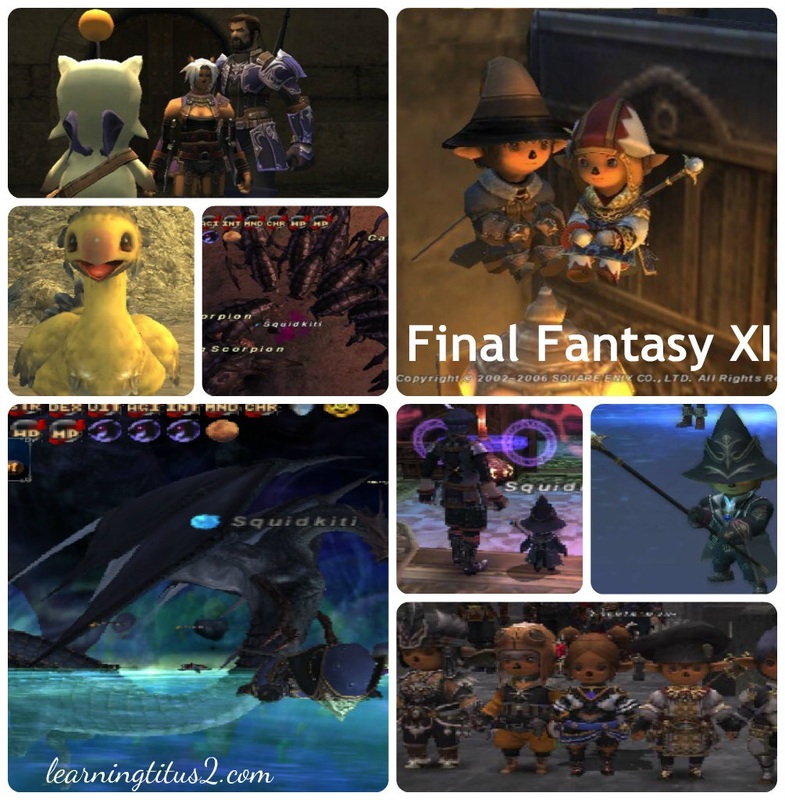 My sons love playing Final Fantasy XI!